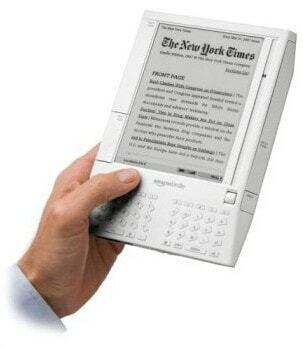 Today, 19 November 2012, marks the 5th anniversary of the launch of the Kindle. I can recall the fateful morning when the digital publishing industry was finally born. Like today, that day was the last Monday before Thanksgiving. It marked Amazon's last chance to get the Kindle out before Black Friday. Amazon feared at the time that without the boost in sales from Black Friday the new device might be regarded as a flop. Now the very concept seems laughable, but back then no one would have predicted that Amazon would sell out of Kindles within hours of the press event. I thought it would be interesting to look back at how very different the ebook world was on the day before the Kindle launched. On the 18th of November 2007, there were still publishers who had rounding errors greater than their ebook sales, and the total reported ebook sales in 2007 was around $32 million dollars - for the year, for the entire US publishing industry. Now there are publishers reporting that level of sales on a monthly basis all by themselves. On the 18th of November 2007, the term digital publishing would best have been used to describe the folks who helped make content available for the web; the digital publishing industry as we know it today was little more than a backroom operation for much of the regular publishing industry. Now digital publishing includes tens of thousands of self-published authors and hundreds of small service providers, distributors, conversion services, and expert advisers. On the 18th of November 2007, the leading DRMed ebook formats were Mobipocket, eReader, MSReader, and Adobe PDF. Today two of the 4 are dead, one is dying, and the last is only hanging around because it has little competition in its core niche. Neither of the major formats in use today even existed on 18 November 2007 (Kindle has expanded to include content beyond Mobipocket). On the 18th of November 2007, the best ebookstore in the US (one of the better ones in the world IMO) was Fictionwise. Today it is being shut down by its parent company, B&N, which runs the second largest ebookstore in the US. On the 18th of November 2007, few publisher cared much if the contract with the author mentioned ebook rights. Now that detail is as bitterly fought over as any other part of the contract, and the last few Luddites who balked at ebooks have been forced to surrender or not have their contracts renewed (Bradbury). On the 18th of November 2007, the term self-published was an epithet. It was a sign of failure, proof that the author in question was so terrible or so nutty that they could never get a real publisher interested in their books. Now self-published is a point of pride for many an author. It is so mainstream that it has some in the legacy industry afraid that they're becoming irrelevant. On the 18th of November 2007, 98% of ebooks sold were in English and the vast majority of ebook sales went to US publishers simply because the US had the only even marginally developed digital publishing industry. Now there are native ebook markets in dozens of countries selling ebooks in dozens of languages. Those are some of the changes I have been able to identify, but they are far from the only shifts in the industry. What changes have you seen?